Looking for ultimate distance? Then look no further than the Zillion TW HLC – Hyper Long Cast. HLC baitcaster brilliance starts with Daiwa’s Real Four, with Real Engine, Real Control, Real Endurance, and Real Custom combining to make the HLC technically advanced. The new super tuned duraluminium HLC spool, is lighter, stronger, and faster, designed for open water distance casting. Combine the HLC spool with the TWS and Magforce Z and you get unparalleled casting performance. 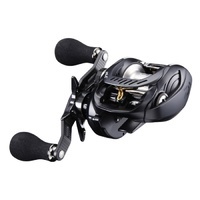 Headlining the impressive design and performance is one of Daiwa’s greatest innovations, Real Four. With Real Engine, Real Control, Real Endurance, and Real Custom combining to deliver unmatched precision, power and performance. An ultra strong, alumiminim frame sees the reel sit assuredly and balanced in the angler’s hand, and palms beautifully for ultimate comfort and control. Giving you the power to take control is UTD. Powerful, unyielding UTD gives you the power and poise to take control of whatever crosses your angling path. A new large clicking Zaion star drag puts this control in easy reach, with its super light, ergonomic design making it easier than ever to crank.